Marick, is now standing stud at Alpakka Lista in Norway. 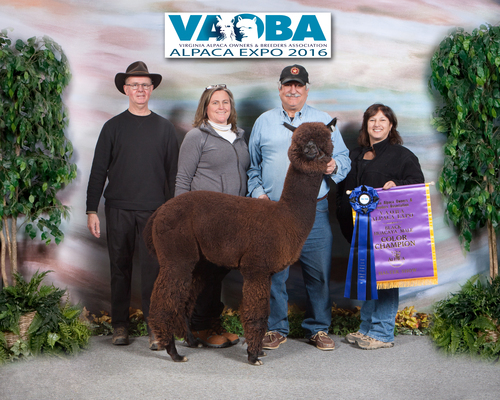 For those who might not remember, Marick was the the 2014 AOA Nationals Brown Champion & Judges' Choice Huacaya Male as well as that year's Futurity RC Brown Male behind his paternal brother, CCNF Magistrate (both sired by the great Snowmass Matrix Majesty). Margarita, is a brown CCNF Royal Ring of Fire daughter we purchased from our old friend Pat Badger out of the same maternal line that produced Snowmass Midnight Magic. Skyhawk's offspring are here and WOW! We are thrilled with our 2018 Skyhawk crop - stunning MSG, DSG, TB, BB and DB. He has stamped each one with his head, spot on conformation and fleeces with outstanding crimp architecture. 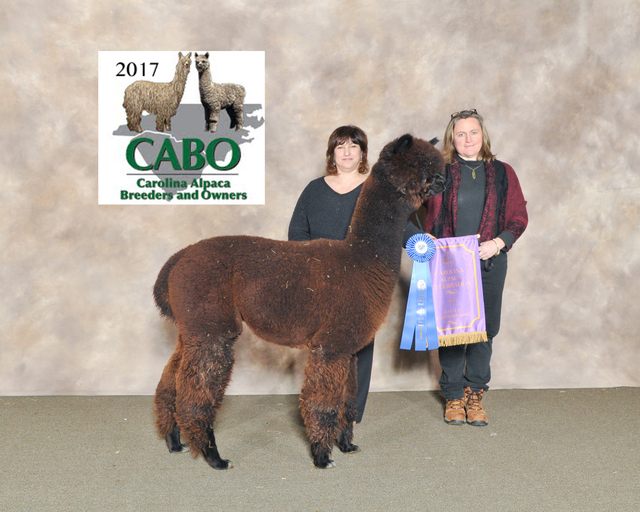 CCNF Skyhawk (CCNF Marick x AG Margarita), whose sire, Marick was the the 2014 AOA Nationals Brown Champion & Judges' Choice Huacaya Male as well as that year's Futurity RC Brown Male behind his paternal brother. 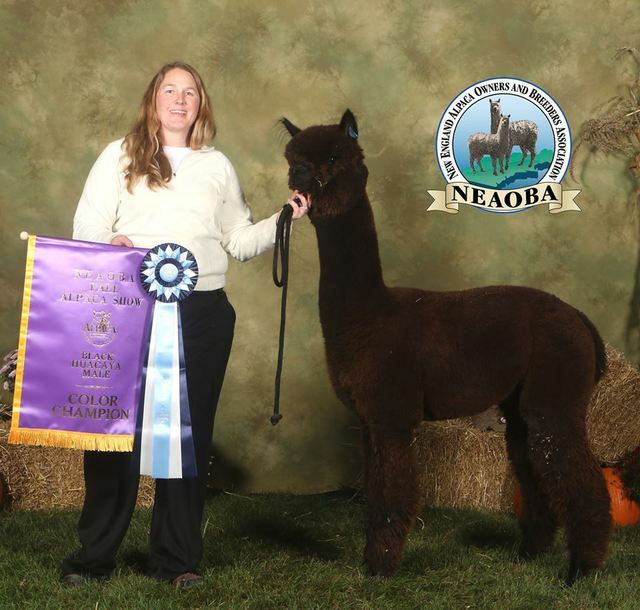 Skyhawk's first show, NAAS/Expo, the senior judges, Amanda VandenBosch and Jude Anderson, each independently agreed that he was deserving of their respective show's Black Male Championship! Black and Grey breeders – proven genetics for your next generation of champions. 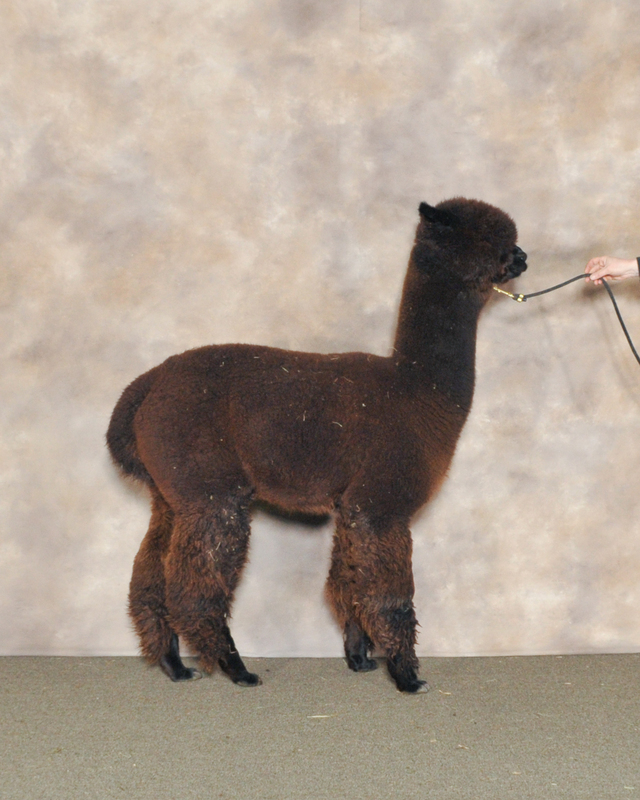 CCNF Skyhawk is the one to breed to for conformation, uniformity, crimp, density and temperament. 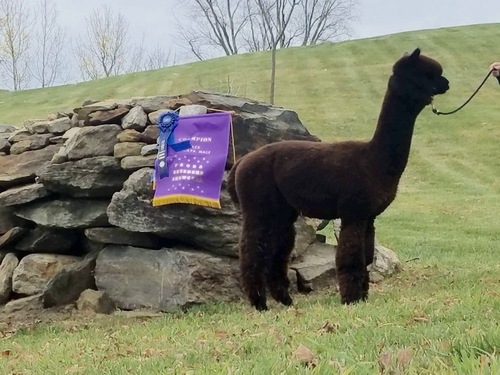 As of February 2017, this young herdsire has amassed 9 Banners. His sire, Multi Champion, CCNF Marick is now residing abroad, (standing stud at Alpakka Lista in Norway), making Skyhawk the first and only male offspring of this pairing in the US. Skyhawk’s pedigree has stellar proven bloodlines. His maternal grandsire is CCNF Royal Ring of Fire and his paternal grandsire is THE all-world Herdsire, Snowmass Matrix Majesty. Let’s not forget to mention his light rose grey, paternal granddam, Maid Marion. Skyhawk started turning heads as soon as he hit the show ring with his stylish good looks and phenotype, compact body, upright posture - excellent conformation. A strong boned male combining density and accentuated crimp architecture with a high degree of uniformity and brightness. We are so happy to have this young male in our program and cannot wait to see what he will do crossed with our .38 Special, Snowmass Kahuna Sunrise and Captain Midnight offspring. Skyhawk is currently standing at CSAF until May 2019. Give us, or one of our partners a call to add these outstanding genetics to your herd. Or purchase a female bred to Skyhawk with a breed back to any of our other stellar herdsires for a 3 in 1 deal. Proudly co-owned with our friends, Lennie & Sue Foss of Elf-Paca Meadows, Maine and Elaine & Chuck Gerber of Woodland Meadow Farm, NY.